Biriyani Masala Mix: (Dry fry on a pan and then grind the following together to make the mix): ½ TSP each of whole Cumin, Coriander, Mace (Jaifal), Cardamom, Cloves, Black Pepper, and ¼ TSP of Mace (Jayatree or Javantri). Whole spices to cook the rice: 1 Bay Leaf, 2 Cardamom, 2 pieces of Cinnamon and 1 medium sliced onion. 2. Now cook the meat on medium heat. You need to cook it adding water little by little, that we call “Koshano” in Bangla for quite long..atleast for 1 hour..Add water covering the meat..cover with lid…When the gravy is reduced add potatos cut in lengthwise…But remember the potatos must not be fully done when the gravy is dried out….when the gravy is almost drying out add 1/4th (one-fourth cup) of regular milk.Dry out the gravy. 3. Microwave or dry roast cumin , whole corriander, cardamom,mace ( joyetree), nutmeg ( jaifol), black pepper, clove together…Grind them into a fine powder and add into the meat. 4. Now in another vessel heat ghee and fry whole garam masalas. Add sliced onin..Fry until golden brown.Add 2 teaspoon of ginger paste and salt to taste.Add the uncooked rice/chaal .Add the meat.If your meat gathers some extra oil then put less ghee while cooking the rice. If You take 2 cups( measuring cup) of rice then add 3 cups of hot water. Cover the lid. Don’t stir. 5. Now when the water is almost dried out add plenty of green chilies, 1/4 th cup milk and dried plum/alubokhara. Turn your stove on low heat that we call to keep the biriyani on “Dom”. Sprinkle some keora water before serving!!!!!!!!!!! 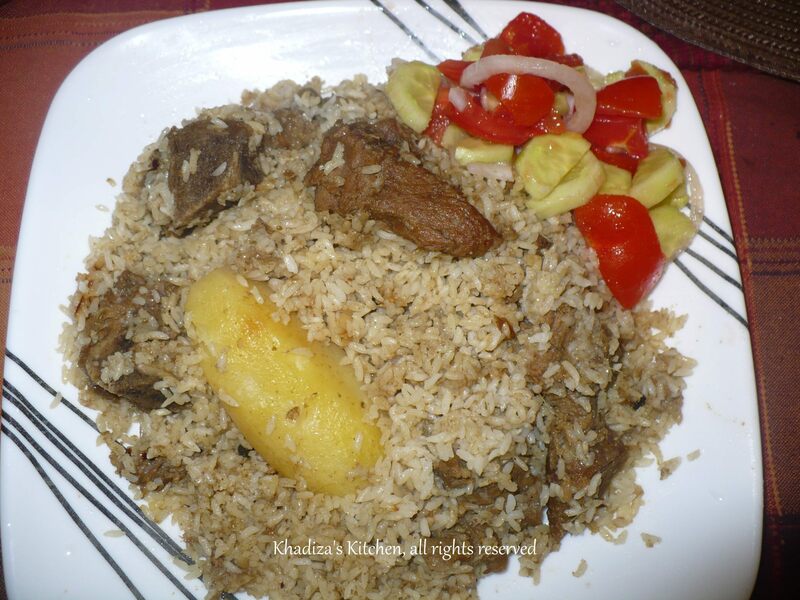 This entry was posted in Biriyani and tagged bANGLADESHI bIRIYANI, bANGLADESHI fOOD, Beef Biriyani, Birani, Biriyani, Desi Food, Gorur Birani, iNDIAN fOOD, pakki biriyani, South aSIAN fOOD, Tehari. Bookmark the permalink. Can u post the authentic kolkota style Kachi biryani plz, plz plz.